The closest estimate I can find is roughly 2500 indoor rinks. And remember that doesn’t count the thousands of outdoor rinks that are constructed in winter. So I guess Australia loses hands down in the ‘we have more rinks than you’ competition, but to save face, we have an ice rink up our sleeve that is arguably one of the coolest in the world! 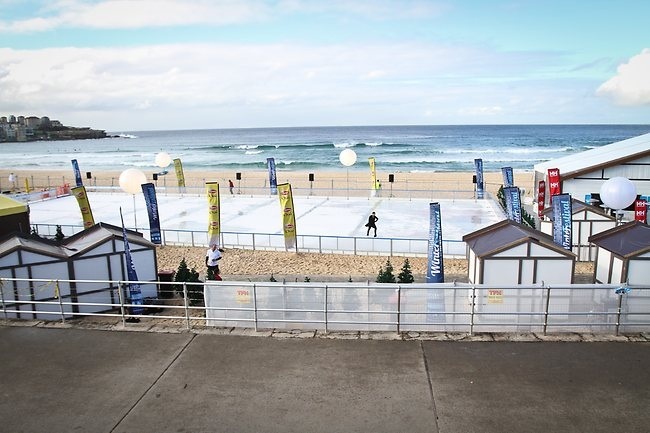 Last winter a rink was set up for the first time on Bondi beach – yes, actually on the beach! 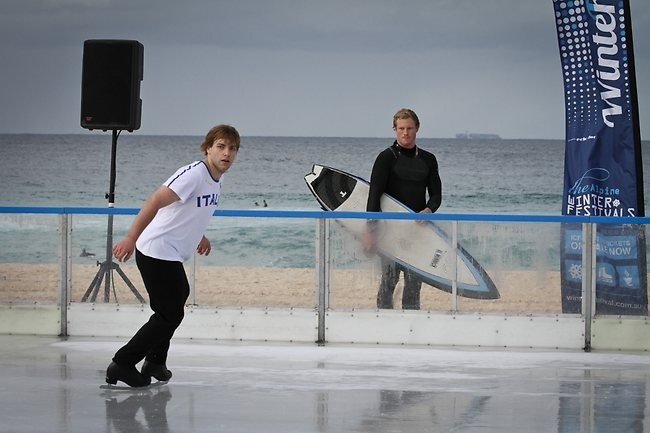 The 900 metre square rink was constructed in 2011 as part of the Bondi Winter Festival. The 18 oC (64 oF) temperature wasn’t a problem, with the specially designed rink able to cope in temperatures up to 30 oC (86 oF). The bad news was that it cost adults $20 and kids $15 to skate on the rink for 45 minutes (plus $7 skate rental). I still think it’s a small price to pay for the one-off experience of skating on the beach! 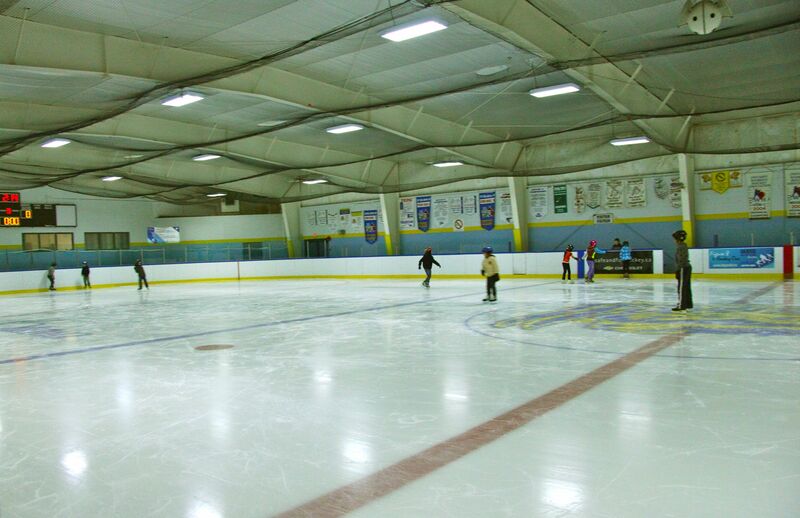 Similar rinks were also set up in Melbourne, Canberra and Brisbane (where the average maximum temperature in the middle of winter is 20oC). 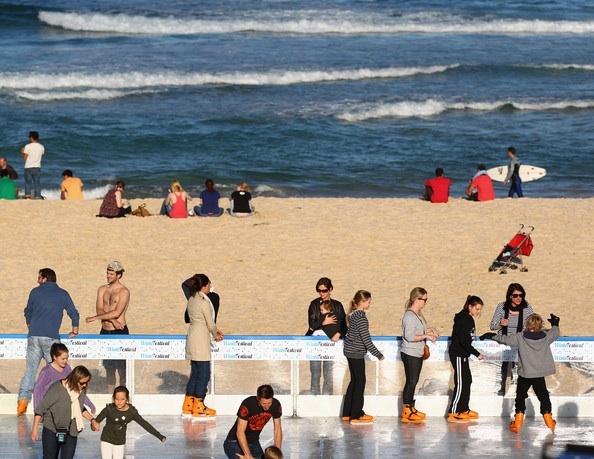 Skating on Bondi beach has just made it onto my bucket list! This entry was posted in Amazing places, Facts and figures and tagged aussie, australia, bondi, brisbane, canada, canberra, canuck, ice, melbourne, miscellaneous, skating, travel. Bookmark the permalink. Last school holidays here in Brisbane, I offloaded third born and took the two bigger kids ice skating (we had been once before and they have pestered me ever since to take them back – because it is such a ‘novelty’). For just me and two kids with skate hire, cost me $46! Yet another NOT cheap school holiday activity.